Cardiff City manager Ole Gunnar Solskjaer says the high frequency of games makes squad rotation essential. The Norwegian defended his decision to start with top scorer Kenwyne Jones on the bench in the 1-0 defeat at Wolves. With a Capital One Cup trip to Port Vale on Tuesday and an away fixture at Fulham four days later, Solskjaer says he will continue to rotate. "I'll always look to freshen things up at times and I'll make more right [decisions] than wrong," he said. "Of course you think it's very simple; you can play the same 11 in 46 league games and you'll be happy. "It doesn't happen like that, it doesn't happen in today's football with the intensity, fitness, short space of time in between games, that's just how it is." The former Manchester United striker said resting Jones on Saturday was "part and parcel of what we're going to do throughout the whole season". Eight new players have been brought into the club over the summer, giving Solskjaer plenty of depth in his squad. "There's going to be games he [Jones] won't play, there's going to be games other players don't play because it's going to be a long, hard season and we need everyone firing," Solskjaer said. 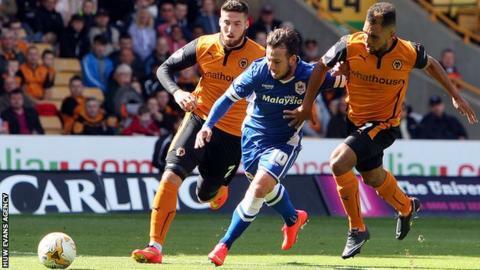 Saturday's loss at Molineux was the Bluebirds' first defeat of the season but Solskjaer says there has been no knock-on effect to Mark Hudson, who scored a last-minute own goal. "Mark is a top pro. He's been as a captain should be - just get on with it. You've got to brush it off, we all make mistakes in the game of football."